British Airways check-in is in Terminal 5 at London Heathrow. I checked in online the previous day but was unable to print my boarding pass. I tried to collect this using the self-check-in machines but this also did not work. At the bag-drop counter I retrieve the boarding pass and check-in my bag – the service is efficient but basic. Security queues are short and I am into departures within 10-mintes of arriving at the terminal – it is a most satisfactory experience. Boarding is from gate A18. There is a short delay but this is well communicated by the gate staff. Various stages of priority boarding are applied. This begins with First Class and Emerald / Gold card holders, followed by Club World and Sapphire / Silver and finally Ruby / Bronze. After this, general boarding begins and there is no zonal approach for this. There is no priority boarding for families, elderly etc. The gate service is quite polite and efficient and despite the delay boarding is complete on-time. Boeing 747-400 in Economy Class was at approximately 70% capacity. 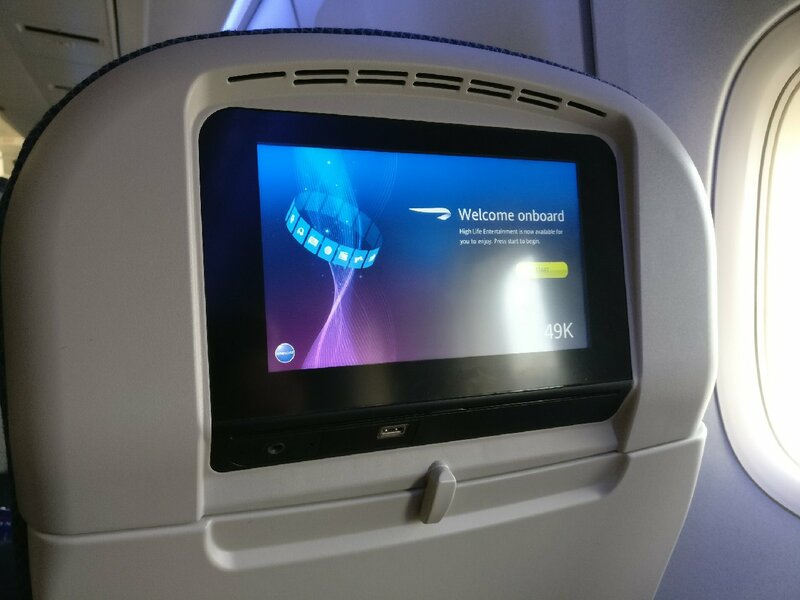 This aircraft is the renovated cabin with new seats and IFE. According to www.britishairways.com the free checked baggage allowance for a World Traveller standard fare is 1 bag (max. 23kg / 51lb per bag). Onboard, customers can take 1 handbag / laptop bag (max. 23kg / 51lb and up to 40x30x15cm / 16x12x6in) plus 1 additional cabin bag (max. 23kg / 51lb and up to 56x45x25cm / 22x18x10in). The Economy Class seat has a 32-inch seat pitch and the living space feels comfortable without the forward seat reclined. The width is good and comfortable and there is also an adjustable headrest. The seat has a 9-inch PTV (widescreen) and integrated USB socket – there is no 110v socket for larger devices. The seat condition is satisfactory – the covers are clean with strong colours (e.g. not faded), there are some marks on the armrest and when I try to adjust the headrest it comes clean off the bracket – which is a surprise. The cabin is clean on boarding. The seat covers are well presented, as are the carpets and these appear to have been renewed. The overhead bins and other cabin panels have not and as such not as presentable. 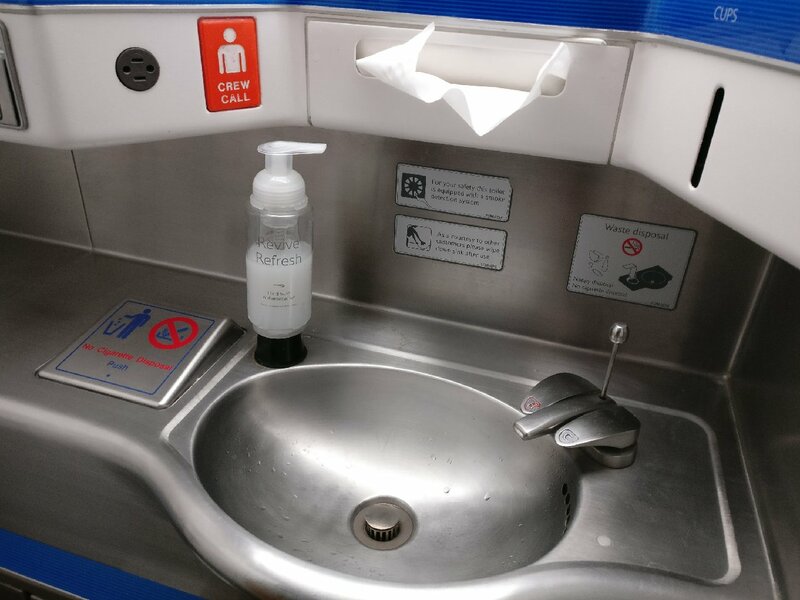 There are 4 washrooms for the Economy Class cabin at the rear of the aircraft – these are clean on boarding but again, have older fixtures and fittings but are well presented. The flight pushed back about 25-minutes late and departed 45-minutes behind schedule however, the captain mentioned that we should arrive with just a short delay into Houston. About 30-minutes after departure 2 carts enter the cabin – 1 per aisle and a bar service is offered. This offers a full range of beverages including beer, wine and spirits – as well as soft drinks, water and juices. I was intrigued by BAs recently introduced “Book the Cook” style service for Economy Class passengers and ordered the “Taste of Britain” option prior to the flight for 16 GBP. This is marketed as an upgraded dining experience and offers 6 options – Gourmet, Taste of Britain, Healthy, Asian, English Breakfast and Vegetarian meal trays. Having tried and been impressed by the service on BA’s sister airline Aer Lingus, I was keen to see how it matched-up. Unfortunately, despite reconfirming with BA customer service prior to the flight, the meal is not loaded. I reported this to the cabin crew and they are quick to offer a meal from Club World. Whilst it was not what I ordered it was an obvious upgrade from the standard Economy Class fayre. Being fortunate enough to travel in Business Class on many trips, I was surprised by what British Airways is passing off as a long-haul premium catering nowadays. It tasted fine, but in my opinion, the presentation and quantity of food is pretty basic by business class standards of 2017. 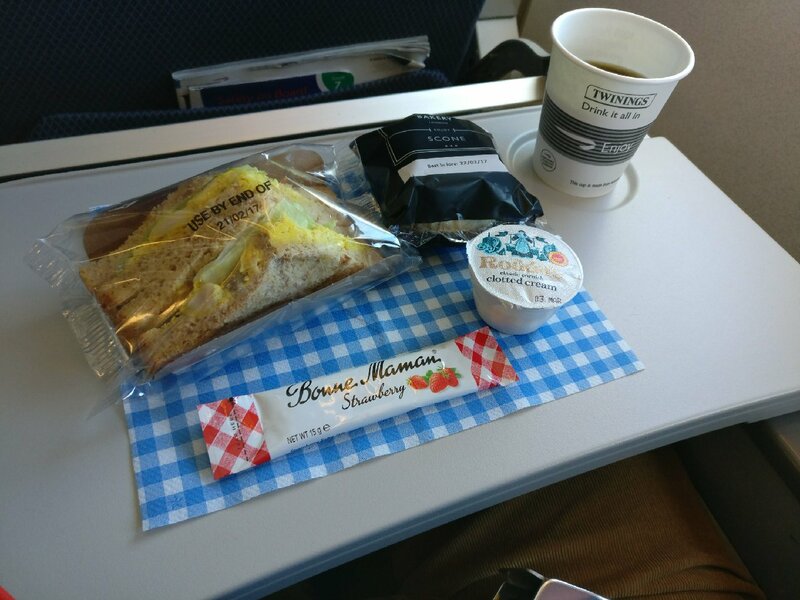 For the second “meal” I was back to the standard Economy Class offer, and this is an afternoon tea snack box, which is quite nicely presented in a faux picnic hamper and miniature gingham rug. It contains half a coronation chicken sandwich and scone with jam and clotted cream – again, the quality of food is good but I cannot help but feel this is the bare minimum food for a 10-hour flight, particularly as BA has cut the free galley snacks. However, one can purchase a cinema priced bag of sweets from the cabin staff. This Boeing 747-400 offers personal AVOD IFE at each seat with a 9-inch screen. The programming selection is extensive – not only in terms of Hollywood / British movies but there are also a vast range of foreign language options. TV programming is also wide ranging with a number of boxset options of the most popular US / TV series. Headsets are the in-ear type and given complimentary. 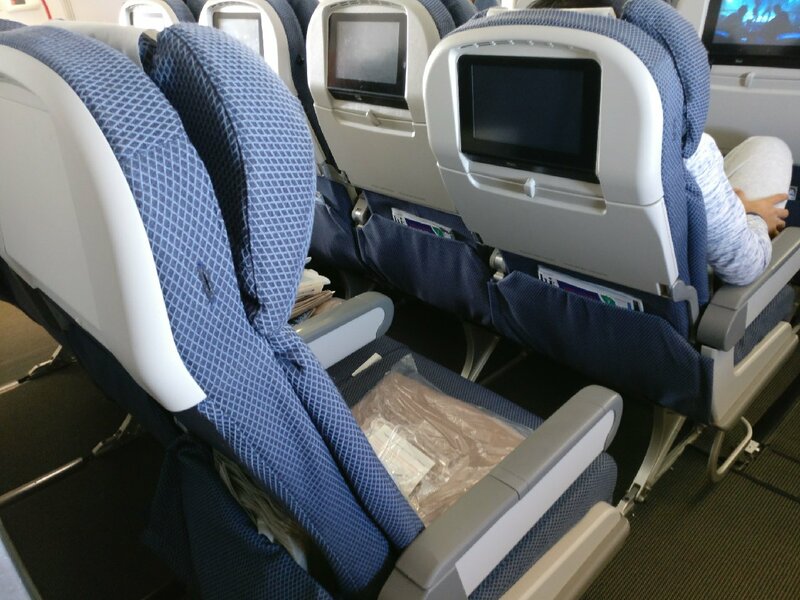 Pillows and blankets are available on each seat prior to boarding and the quality is meeting a satisfactory standard – there is no comfort pack (eye mask etc). There is standard pipe soap in the washroom. I was quite happy with the staff service overall, and the crew were quite cheerful and polite. They respond very quickly to my missing meal order and said they had reported the issue. In fairness, I was refunded without having to chase up customer service, which I was surprised about. Outside of the main services they did tend to stick to the galley, so for any additional drinks you had to fetch them yourself. As the flight wasn’t too busy this was fine as it was easy to move in and out of my window seat. It was an above average experience in terms of the crew interaction, but it was just a shame there wasn’t a bit more of it. Upon arrival into Houston, there is the usual throng of ground staff with wheelchairs that are an inevitable presence for any US arrival nowadays. Once past this, it was a short walk to immigration which took about 20-minutes – bags have started to arrive as I reach baggage claim and my own luggage comes out less than 5-minutes after this. Overall, the missing meal order aside, the flight experience wasn’t bad. The staff dealt with this issue well. 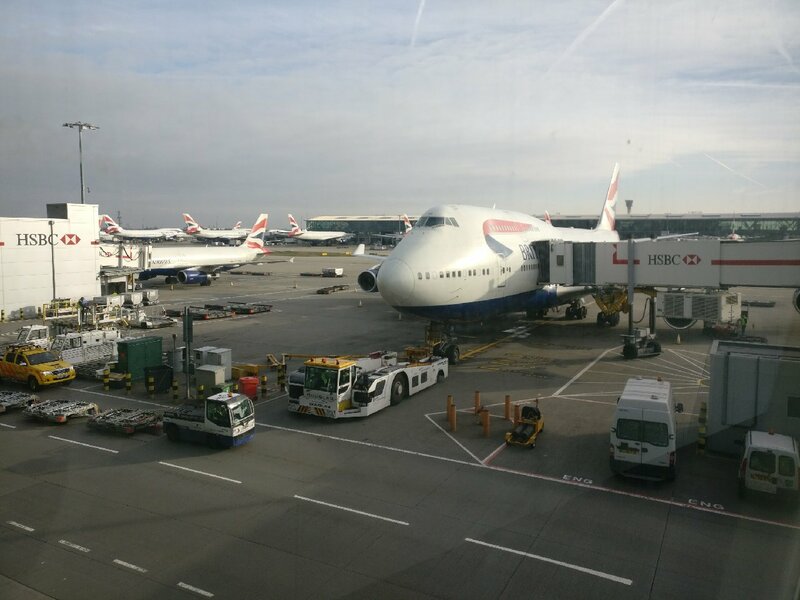 They were very apologetic and as it turned out, their internal reporting system meant that I didn’t have to again deal with the BA call centre, which I found the experience to be consistently poor leading up to this trip. I like the Heathrow Terminal 5 experience – it is nearly always efficient for departure which is my main concern. In terms of the aircraft, I am a fan of the Boeing 747-400 and it is always a treat (albeit quite rare) to come across one nowadays. It is nice that the seats and IFE have been upgraded but there are certainly areas where the aircraft is showing its age. 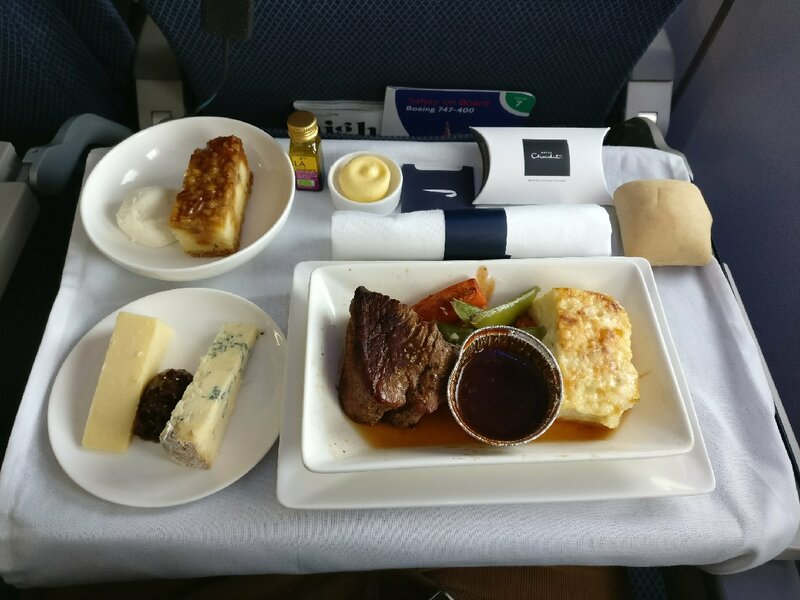 Having travelled with many of the transatlantic majors in the last 12 months, British Airways Economy Class catering is pretty average in terms of the quantity and quality is fine. For those that partake, it is nice that one can still get a decent gin and tonic without being charged extra, but it remains to be seen if BA will remove this perk in the future! 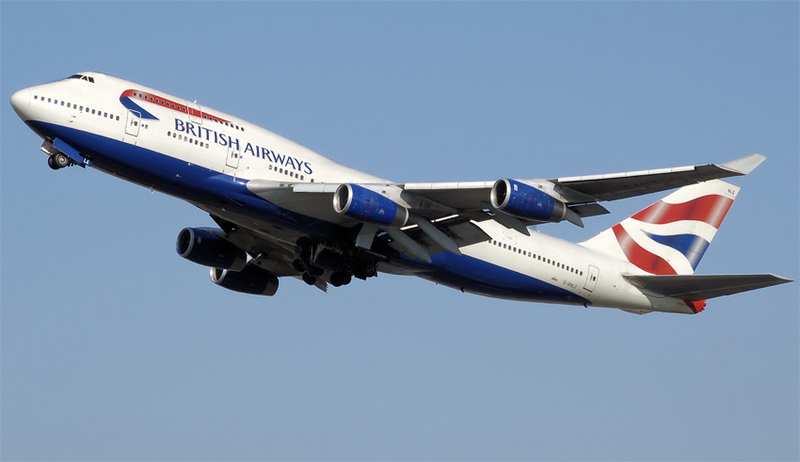 In terms of value for money, I just fail to see it any more with the fares that British Airways charge. They have almost cut back to the bare essentials in Economy Class and aside from the IFE / bar product, everything is average or below. The fare was north of 750GBP return from a travel agent. From BA, it was more than 1000GBP. This was not, by any means a last-minute reservation (6 weeks in advance). I didn’t get my original afternoon flight (on the newer Boeing 787) as it was cancelled and I was moved to a less sociable early morning departure. For this I received a standard copy / paste non-apology from BA stating they had fulfilled their T&Cs – despite the inconvenience to me. It was a disappointingly poor, non caring response. Ranked as a 4-Star Airline, the continuing cuts to British Airways business and economy class product standards makes their rating look unsustainable. The BA staff service is about the only saving grace at this time, but morale seems to be dropping there as well.